We certainly saw some diverse inventions in the den tonight. From the Loodini to seaweed seasoning, you never know what’s going to come out of the elevator! No matter how wacky the idea, there are always potential IP opportunities to be had. One of the two entrepreneurs lucky enough to bag an investment from the Dragons was John Tague. 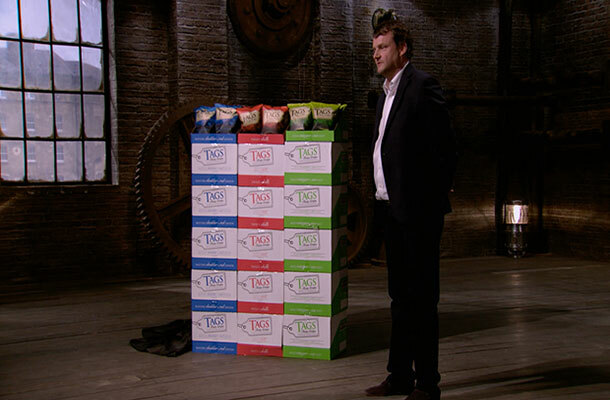 John was pitching for 125k in return for a 10% share in his business Tags®, selling a range of savoury crisps. Although John had successfully got his product onto the shelves of several major supermarkets, Touker Suleyman was concerned it would be overshadowed by the major crisp brands. Trade marks - A trade mark helps consumers to distinguish your goods and services from your competitors and can be integral to building a brand. The most effective trade marks are those which are distinctive for the goods and services they protect. This can be a word, phrase, picture, shape, colour, sound, or any combination of these. A quick check of our trade mark database tells me that John has registered the word mark Tag’s, so he is already on the right track. Trade secrets – Some of the best known food and drink (Coca Cola, Lea n Perrins and Irn Bru to name but a few) are protected by trade secrets. Trade secrets are free, have no expiry date (providing you can keep a secret!) and are not disclosed to the public, like patents. If John was to invent a new flavour or a unique way of cooking the crisp for example, he may want to consider keeping this a trade secret, to give him the edge on his competitors. However, trade secrets can be difficult to keep and cannot prevent others from independently inventing the same thing. As John delivered his appetizing pitch, he confessed there had been a conflict of interest between himself and a previous business partner. Although John didn’t elaborate on the outcome of this dispute, it got me thinking about the importance of IP ownership. Intellectual property rights usually belong to the person who created the work, although there are exceptions to this rule. Generally, when a work is created during employment, it is the employer that owns the rights to the work. Also, commissioned works are typically owned by the person or organisation who created it and not those who commissioned it. For this reason, it is advisable to determine who owns the IP rights early on and confirm this in writing, to avoid any later confusion. If however you find yourself involved in a dispute over IP, you may want to consider mediation before going down the litigation route. Mediation is an alternative way to solve a dispute and is often quicker and cheaper than going to court. In a mediation, the mediator helps the opposing parties to discuss the issue and reach an amicable decision. You may be interested to know that the Intellectual Property Office offer a mediation service. Providing all parties agree to participate, the IPO can make all the necessary arrangements to mediate, either face to face or over the telephone. The costs are based on the length and total value of the mediation, although the majority of mediations settle on the day. Luckily for John, the only contest was between the Dragons, who were all hungry to work with him. He eventually shook hands with Deborah and Peter for the full amount in return for a 30% share. Most businesses will own or use some form of IP. To ensure you’ve identified and properly protected all your IP assets, why not give your business the once over with our free IP Health Check tool.